A Coastal town, a cowboy poet, an autograph library, and a giveaway! Christmas Cove, Maine, is known for its name, of course, and it’s scenic location on the rugged Maine coast. But its history also includes a very special library. This famous institution was started by writer William Lawrence “Larry” Chittenden, who was also known as “The Poet-Ranchman.” He lived from 1862 to 1934 and published a great many poems. 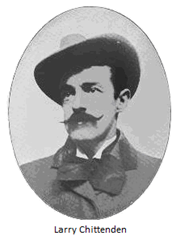 The most famous is probably “The Cowboys’ Christmas Ball,” first published in 1890. But what does a cowboy have to do with Christmas Cove, Maine? Chittenden is one of many writers who had summer homes along the Maine coast or on the shores of its pristine lakes. They could get away from the heat of the south—in Chittenden’s case, the Anson, Texas heat—by spending summers in New England. 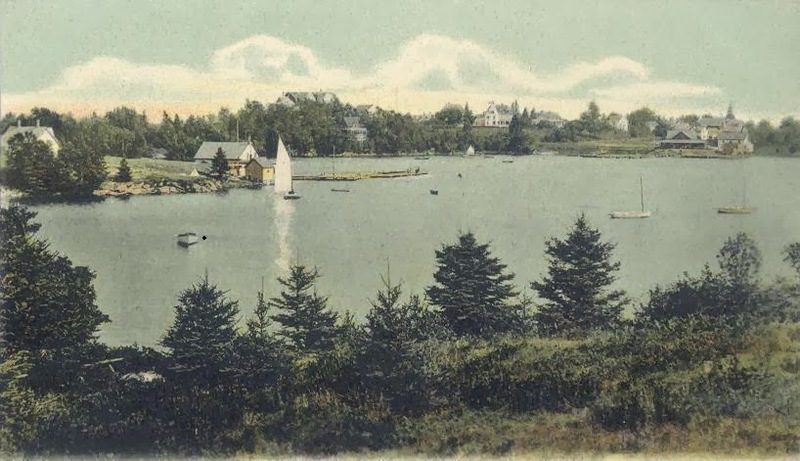 His house on the shore at Christmas Cove was called “The Sea Birds’ Nest.” This view of Christmas Cove is from a 1906 postcard. Like all writers, Chittenden was a lover of books and libraries. He made collecting autographed books his hobby, and his library grew. He allowed the people of Christmas Cove and the nearby town of South Bristol to borrow these books for free, and it was considered a public library. Larry Chittenden was a trusting man! But then, I think people were more conscientious about taking care of other people’s property back then. In 1918, the Maine Library Bulletin reported that the library at the Sea Birds’ Nest contained more than 2,000 volumes, each one autographed by the author/donor. Some of the better known authors who contributed books were Theodore Roosevelt, Woodrow Wilson, Cleveland Moffett, and Lyman Abbott. Yikes! Can you imagine going to your public library today and checking out a book written and autographed by a former president? 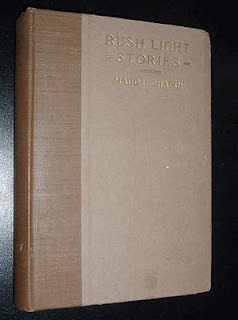 Many of the authors’ names are not familiar to us now, but a hundred years ago some were very popular, and the people of the Maine coast were eager to get their hands on Larry Chittenden’s reading material. Lyman Abbott, one of the authors, was an influential minister, author, lecturer, and editor. He wrote many books on theology and religion, philosophy, and a few biographies, including one of Henry Ward Beecher. Cleveland Moffett was a journalist, author, and playwright. He wrote mysteries and adventure tales, both as short stories and novels. I think I’d like to read his True Detective Stories, or his novel, Through the Wall. Unfortunately, Larry Chittenden’s autograph library no longer exists. The people of Christmas Cove lost a treasure when the Poet-Ranchman died. Books from his library, with the authors’ signatures and bookplates or stamps for the Christmas Cove library show up occasionally at auction. One of Theodore Roosevelt’s lesser-known volumes, Fear God and Take Your Own Part was auctioned not so long ago at Heritage Auction Galleries in Texas and brought $1,434. 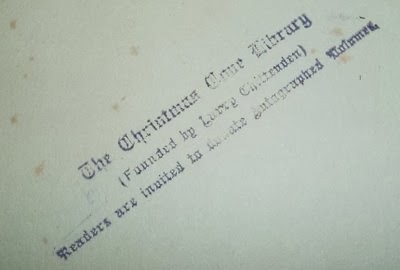 That book bore a pictorial bookplate featuring photos of Christmas Cove and bore the inscription “The Christmas Cove Library (Founded by Larry Chittenden)." Roosevelt signed the bookplate and dated it Sept. 10, 1918. 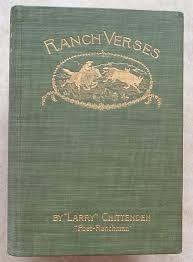 Whether your interest lies in Maine, Texas, or somewhere in between, you might want to keep an eye out for an old Christmas Cove library book—or one of Larry Chittenden’s books of poetry, such as Ranch Verses. This week, in Larry Chittenden’s honor, I’m giving away a Maine book and a Texas book. Two winners will be drawn and given a choice of my Maine Brides collection or Texas Trails novel Cowgirl Trail. Susan this is so interesting today a post that has the beautiful shores of Maine and a rugged rancher who is a poet, I did not know of him or this place in Maine and have enjoyed reading your post, going to search out little more on this man. thanks for sharing today, I would love reading your books too, you are a talanted woman. Thanks, Paula. I lived in Maine more than 50 years and I keep learning new things about it. Agreed! I think we all feel a little jealous that we didn't get to go to this library. Susan, I absolutely loved reading your post. It was so very interesting. I visited Maine for the first time summer before last and I thought it was beautiful but I am a Texas girl through and through. Thank you so much for sharing and have a very Merry Christmas. So many people have ties to both states! Glad you were able to visit, Melanie. I love to hear stories about towns with Christmas names. We went to Maine almost 12 years ago, but missed that town. Beautiful country up there and so different from the Texas coastline. Thanks for sharing not only about the town, but also about the library. Thanks, Martha. I started out to research the cove in general, but the library merited its own post! Susan, how interesting. I've heard of Christmas Cove, but not the autograph library. What a shame that it no longer exists. I have an autograph shelf with the books of writer friends. I even have a signed book from Louis L'Amour. I need a library! What a great idea, Margaret. And Louis L'Amour--that in itself is a treasure! Susan, what a shame Mr. Chittenden's library was not left intact ! Yes, 100 years later it's still beautiful. Thanks, Jackie! Christmas Cove sounds delightful and I am fascinated by the autograph library. Larry Chittenden and his library were certainly treasures! I am sorry that the library no longer exists. Thank you so much for sharing this wonderful history today. Merry Christmas! Britney, it certainly was a loss. I felt it keenly when I was reading about it and longed to visit the Sea Birds' Nest. Susan, I consider myself a total buff as far as Texas writers are concerned but have never heard of L. Chittenden. I share another's comment that it is such a shame the library wasn't held together. Seems there's a strange (or, is it popular) connection between Texas and Maine. I, too, long to visit the state that seems so inviting to parched Texans when July, August, September roll around on the calendar. Thanks for the interesting post. Karen, I hope you get to visit Maine some summer. Thanks! I love libraries too. I'm glad to hear San Diego has a new one. Long live libraries! Susan, I was looking through emails and found your blog post regarding Christmas Cove, Maine, and went back in time several years to the summers when we spent 2 weeks in Maine. One of my favorite places was Christmas Cove. I loved it there, and would love to get back there to see if it's anything like it was when I last visited. Such interesting information regarding Larry Chittenden's autographed books and library. What a step back in time this is for me. Thanks so much for sharing about one of my favorite places in the country! You're welcome, Nancee--and thanks for dropping by and sharing your connection with us. What a special memory! This post was so interesting! As an historian, it's disappointing to hear that Chittenden's library was broken up and books sold. However, this is such an interesting story, and what a great man for making all those books available to the average person! Oh, I know, Mallori! I think we all wept a little for those lost books. I really can't see a library like this one working today, but I do like sharing books that I love with friends that I love. Hi Susan! Thanks for you post on such a fascinating library, its founder, the beautiful town it was in and the awful shame of the loss of such a neat and unique library! I love New England especially Maine and New Hampshire. They have some of the prettiest and quaint yet quirky kind of towns! Christmas Cove sounds like that kind of town exactly! I wish I could have walked the aisles of this library just once - I would've been in hog heaven! I would love to win your Maine brides book. Thanks--and I have to agree about the scenery and lovely little towns in northern New England. And the winners are: Amy C. and Kam110476. I will contact you individually. Thanks everyone for taking part in this journey to the coast of Maine! So sorry, Maxie! I didn't specify the date, but will try to do that in the future. Very interesting about your book collection! You know, you all can come over to my website anytime at susanpagedavis.com and enter my monthly giveaways there too. I have never visited either Maine or Texas and would love to read either book! They both look like very good books. Thanks! I love Maine, but I'm glad I'm not there right now. So many people are COLD! I do recall vividly the ice storm of 1998, when we lost power in January for eight days. We had friends staying with us who had relied on electricity to run their furnace. We had a very reliable wood stove and kept warm, but it was hard. On the other hand, I've been privileged to visit Texas several times, and it's a wonderful place. So huge, though, that I'm sure no one could ever know everything about Texas! Always more to learn. Very interesting! Amazing the stories we have yet to discover through others. I've written a book set in Texas, but have only visited the state. Would love to visit Maine. Maybe someday. Thanks for coming by, Eunice. I agree--there's always more to learn! What an interesting post! I love books! I would like the Maine book if I should win. Thirty years ago my husband and I talked about taking the train to Maine for our honeymoon trip but ventured to Door County, Wisconsin's thumb. I would like to read about these Maine brides!